The MD program is a professional doctorate degree which provides the competencies to practice medicine and the foundation to continue postgraduate medical training. It has been designed to be consistent with the model of graduate entry medical education and is competency based. 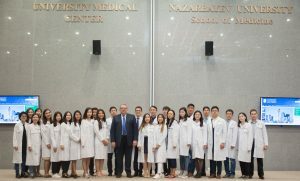 The carefully designed curriculum structure features active and participatory learning, problem and team-based approaches, an early introduction to the patient and to the community and the integration of a rigorous foundation in basic and clinical biomedical sciences with the behavioral and social aspects of medicine. Key subject matter is longitudinally integrated throughout the curriculum, building upon a foundation of prior learning while providing a progressive introduction of new content. More detailed information about the MD program can be found here. 1. A bachelor’s degree and/or master’s degree (or equivalent). 2. A minimum grade point average of 3.00, based on a 4.00 point scale (or equivalent on a 5.00 point scale). 3. Completed at least two science subjects, including but not limited to, one year of biology with lab or equivalent and one year of general chemistry with lab or equivalent. - the applicant is a graduate of Nazarbayev University. 5. MCAT score of 489 is required in order to be invited to an interview. 1. Completed Application Form that can be accessed after registration at http://admissions.nu.edu.kz. 2. Two (minimum) to four (maximum) confidential letters of recommendation written within the last 12 month. At least two letters must be from faculty in science departments. 3. Degree diploma with transcript. During the application period final year students may upload official current transcript for consideration. 4. IELTS or TOEFL test report/certificate valid as of date of online documents submission. 5. MCAT score valid as of date of online documents submission. In order for the score to be valid, the submitted MCAT scores must be for a test taken no more than three years prior to application. 6. Document stating the presence or absence of a criminal record. 7. 086у medical certificate (for Kazakhstani candidates) or a similar medical certificate with indication of general health or other document as requested by the University (for international candidates). 8. Notarized scanned copy of the applicant’s identity card (with notarized English translation) or passport. 10. An essay on how the candidate would enrich the NUSOM community (500 words or less).